Oh Netflix, how you never cease to amaze me. You double your rates; an 800,000-strong subscriber exodus and a 75 percent stock value plunge quickly ensue. You refuse to be deterred. Attempting to recover the ground you’ve lost, you tell your remaining members about this new service called Qwikster, only to shutter the service less than a month later. Realizing that, to your disappointment, consumers hadn’t forgotten about the original cause of the problem—100-percent price hikes—you were left with no choice but to sell $200 million worth of stock just to keep enough cash in the bank. Things were looking good—especially after your fourth quarter numbers came out. But like all good things, that, too, came to an end. When faced with the choice between respecting user privacy and the prospect of flooding Facebook feeds with ad-like status updates, you opted for the latter. Under the guise of trying to “modernize and simplify” the Video Privacy Protection Act, you once again left yourself open for more consumer disillusionment by attempting to get an app to pass legal muster—an app that I and countless other Netflix members found rather invasive. To make matters worse, your meddling with consumer privacy—especially so closely after a historic Internet-based protest that stopped SOPA and PIPA dead in their legislative tracks—threatened to create a situation that would have made the original rate hike pale in comparison. Fortunately for you, that headline has since faded into the black with nary a word. But it appears any attention, even bad attention, may be preferable to no attention at all. After nearly two months of relative calm, you’re back in the headlines. The seemingly harmless purchase of the domain name DVD.com has rekindled the not-so-fond memories I would think a company like you would prefer to keep buried far beneath the media’s radar. Without warning, DVD-only selections are said to be disappearing from your search results. 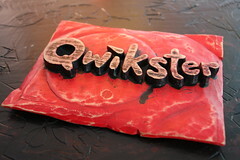 The service formerly known as Qwikster appears to be making a resurgence. The business that once was, then wasn’t, may now be again. What would better serve as a bridge between your streaming and DVD services has become a wall, separating the high-overhead business of running a successful DVD service from a streaming business that only promises to become more costly to you as other businesses begin competing for market share. Worse yet, those coming onto the scene all have several times the cash you currently do, thanks to those managerial blunders we all wish to forget. But for some reason, you won’t let us. Why, Netflix? Why press us to relive memories which only threaten to cause you further harm? Why risk what you cannot afford to lose? Some may call it a good idea, but to me it reeks of desperation, of that fraught decision of a near-bankrupt poker player going all in, hoping that a good bluff will keep him in the game. Instead of passing on a few hands while the others cut each other down to size for a while, you apparently prefer to risk it all while you’re at your weakest and they’re at their strongest. And if that’s the way you intend to play your cards, it seems there’s only one thing left to say: It was fun while it lasted.